Warner Bros. Pictures presents in association with Village Roadshow Pictures A Kennedy Miller Production in association with Animal Logic Film. 2006. Director: George Miller. Original Muisc: John Powell. Warner Sunset / Atlantic. 7567839982. 2006. 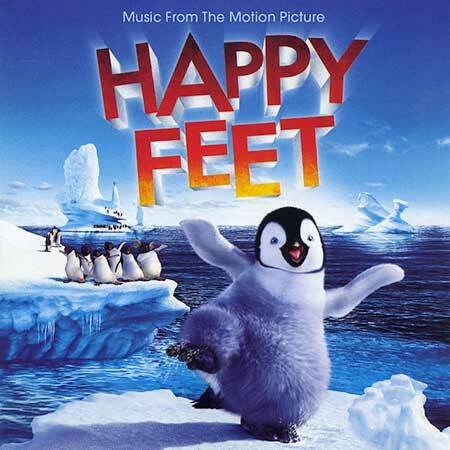 “HAPPY FEET MUSIC FROM THE MOTION PICTURE”. 01: The Song of the Heart. v: Prince. 4:36. 02: Hit Me Up. v:Gia Farrell. 3:16. 03: Tell Me Something Good. v: Pink. 3:11. 04: Somebody to Love. v: Brittany Murphy. 3:47. 05: I Wish. v: Patti LaBelle, Yolanda Adams and Fantasia Barrino. 3:32. 06: Jump N’ Move. v: The Brand New Heavies (featuring Jamalski). 3:22. 07: Do It Again. v: The Beach Boys. 2:27. 08: The Joker / Everything I Own. v: Jason Mraz mash-up with Chrissie Hynde. 4:06. 09: My Way (A Mi Manera). v: Robin Williams. 1:45. 10: Kiss / Heartbreak Hotel. v: Nicole Kidman mash-up with Hugh Jackman. 2:36. 11: Boogie Wonderland. v: Brittany Murphy. 5:10. 12: Golden Slumbers / The End. v: k.d.lang. 4:16. 13: The Story of Mumble Happy Feet. Written and Produced by John Powell. 5:51.